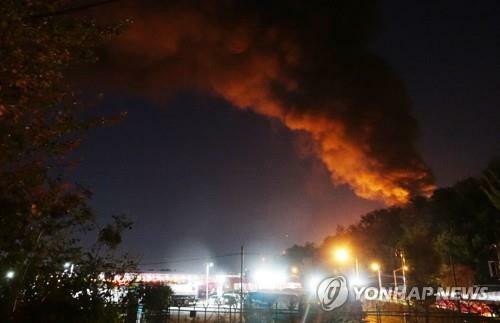 GOYANG, South Korea, Oct. 7 (Yonhap) – The explosion of an oil storage tank in Goyang, northwest of Seoul, caused a massive fire on Sunday, though no casualties were reported, authorities said. The tank, owned by the state-run Daehan Oil Pipeline Corporation (DOPCO) in Goyang, Gyeonggi Province, caught fire at 11 a.m. and exploded with a roaring sound at around noon, Goyang fire station said. The blaze has sent fumes and toxic gas to nearby areas, even noticeable in some parts of Seoul on Sunday afternoon, according to several witnesses. The tank contained about 4.4 million tons of gasoline and is surrounded by a wall with a thickness of 60 centimeters, which prevented the fire from spreading in other areas, Goyang fire station said. No casualties were reported because no employees were at the site at the time of the explosion. Oil mist in the tank was suspected to have caused the fire, authorities said, noting an in-depth analysis is currently underway to figure out the exact cause of the accident. Kim Kwon-un, the chief of Goyang fire station, said it took longer than expected to extinguish the fire because of a large pool of oil kept in the storage, adding that another large explosion is unlikely. DOPCO CEO Choi Joon-sung offered an apology for the accident, noting the fire is expected to put out around 11 p.m.